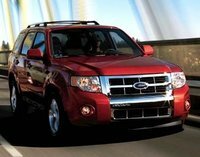 A stalwart of Ford's lineup since the beginning of the 21st century, the Ford Escape compact SUV holds down the entry-level spot in the automaker's range of SUVs, which also includes the Explorer and the Expedition. 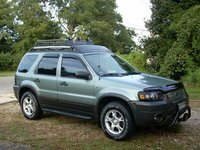 Throughout this century's first decade, the Escape proved popular with buyers and became a versatile vehicle for the automaker, since slightly restyled and rebadged versions were sold as the Mazda Tribute and the Mercury Mariner. Both are either gone or soon-to-be gone, and it looks like the current Escape will also soon disappear from showrooms, to be replaced in 2012 by a new version based on the European-bred, more sleekly designed Ford Kuga. Despite a number of exterior updates and the addition of a number of high-tech features in recent years, the Escape remains largely unchanged under its skin since its introduction a decade ago. It retains its somewhat boxy, truck-like exterior design, which some consider outdated, and rides on essentially the same platform, with a 103.1-inch wheelbase. However, overall length has fluctuated over the years, from 173.0 inches upon introduction to 174.9 inches in 2005, when it received its first exterior updating, to its current length of 174.7 inches, which appeared with a second-generation refresh in 2008. 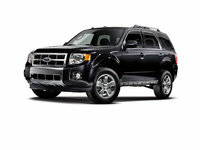 Ford offers the 2011 Escape in base XLS, midlevel XLT, and top-of-the-line Limited trims. Each comes with either front-wheel drive (FWD) or full-time all-wheel drive (AWD). A 171-hp, 2.5-liter Duratec four-cylinder engine provides base power for all three trims, although Ford offers an optional 240-hp, 3.0-liter Duratec V6 for the XLT and Limited trims. The engines link to either a five-speed manual or a six-speed automatic transmission, which has garnered good reviews due to its smooth shifting. Overall, however, many find the engines noisy and lacking the performance and refinement of powerplants from competitors such as the Toyota RAV4 and the Honda CR-V. The EPA estimates fuel economy numbers of 23/28 mpg for the four-cylinder with the manual transmission and 21/28 with the automatic, for FWD trims. The V6 manages numbers of 19/25 for front-wheel-drive trims. The FlexFuel-capable V6 runs on either regular gas or E85 fuel. 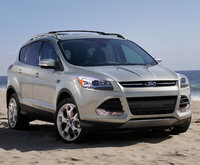 In addition, Ford offers an Escape Hybrid trim, aimed toward owners who value fuel economy. Available in Base and Limited trims, it posts respectable fuel economy numbers of 34/31 mpg. Power comes from a 2.5-liter Atkinson-cycle gas engine mated to two electric motors (one to drive the wheels and the other to start the vehicle), as well as a 330-volt nickel-metal-hydrid battery. The Escape Hybrid can travel at speeds up to 44 mph in full electric mode, after which the gas engine kicks in to boost performance. At the end of the 2011 model year, Ford plans to shut down current production of the Escape and move assembly of the revamped vehicle from Kansas City, Missouri, to the automaker's plant in Louisville, Kentucky. When production resumes, the Escape will morph into its new incarnation, based on the Kuga, which debuted in Europe in 2008. When the Escape re-emerges, its truck-like lines will be be gone, replaced by a more aerodynamic shape on a slightly smaller platform. 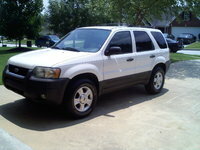 The Ford Escape created quite a buzz when it first appeared in showrooms with the 2001 model year. 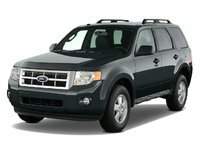 Unlike many truck-like SUVs available at the time, including Ford's own Explorer, the Escape sat on a car-like platform, with a unibody design, independent suspension, and rack-and-pinion steering. It was widely praised for its sporty design and nimble handling. Co-developed by Ford and Mazda, the Escape carried up to five passengers and offered 33 cubic feet of cargo space with rear seats up, which expanded to 63 cubic feet with rear seats folded down. A 130-hp, 2.0-liter Zetec four-cylinder engine, borrowed from the Focus, served as the base powerplant for the original Escape. However, owners could upgrade to a 3.0-liter, 24-valve Duratec V6, which delivered a more respectable 200 hp. Borrowed from the Taurus, the optional V6 distinguished the Escape from many of its competitors, which offered only four-cylinder powerplants. The Escape wasn't a great off-road vehicle, but Ford realized the value of creating an SUV designed primarily for suburban streets and interstate highways. 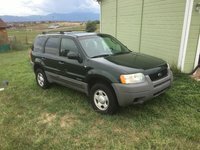 The 2001 Escape came in entry-level XLS and better-equipped XLT trims. Both trim levels were available with either FWD or AWD. Antilock brakes came standard for the XLT trim, and owners could add front-side airbags as an option for both trim levels. Standard equipment included front bucket seats, air conditioning, power windows and door locks, remote keyless entry, a tilt steering wheel, a rear liftgate with a glass hatch, and a four-speaker AM/FM audio system with a CD player. The XLT added cruise control, an upgraded audio system, and premium cloth upholstery, as well as a wider range of options, including leather upholstery and a 6-CD changer. Both trims rode on 15-inch wheels, though owners of V6-powered XLT trims could add 16-inch wheels as an option. In 2003, Ford added an upper-level Limited trim to the Escape lineup. The following year, in 2004, Ford launched the Escape Hybrid for the 2005 model year, becoming the first automaker to introduce a hybrid SUV. In a nod to this milestone, the North American International Auto Show named the Escape Hybrid the 2004 North American Truck of the Year, making the vehicle the first hybrid SUV to receive this award. Ford increased horsepower for the Escape's base powerplant in 2005. The new 2.3-liter, DOHC Duratec four-cylinder engine produced 153 hp and 155 lb-ft of torque. The optional V6 remained unchanged, putting out 200 horsepower. The automaker also gave the Escape a minor makeover, which included updates to the seatbelts, airbags, and AWD system, as well as a freshened exterior design. A second-generation Escape debuted in 2008, although most of the changes focused on the interior. (Mechanical updates would come a year later.) Ford updated the Escape's center console, instrument cluster, and interior lighting system. In addition, new seats were made from eco-friendly materials. Outside, the Escape received a new grille and headlights, as well as restyled wheel arches. In addition, the automaker gave the Escape a new roof design and added insulating materials, which resulted in a quieter cabin. 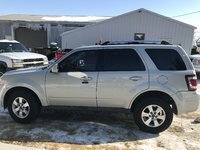 Updates for the 2009 version of the Escape included a new six-speed automatic transmission and a new 2.3-liter Duratec base four-cylinder engine, which boosted horsepower to 171. Ford also upgraded the optional V6 powerplant, which now generated 240 hp, and added 22 more hp to the Hybrid's powerplant. Fuel economy numbers for all powerplants improved as well. Outside, a full front spoiler and rear tire spoilers fine-tuned exterior aerodynamics and helped ensure good fuel efficiency. Other upgrades for 2009 included a retuned suspension and a new braking system for the Hybrid. New features for 2010 included the addition of Ford's MyKey system, which enables parents to limit the car's speed and the audio system's volume when teens are driving. In addition, Active Park Assist joined the options list for the Limited trim. Sales started strong for the Escape, but slipped a bit a few years after launch. The second-generation redesign helped boost sales somewhat, but it's clear the Escape is showing its age, making the upcoming, revamped Escape based on the Kuga long overdue. 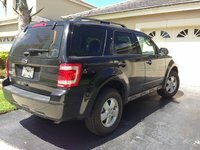 In 2005 and '06, Consumer Reports rated the Ford Escape as a Best Buy, but also recently noted that resale values for the Escape have been lower than those for most of Ford's other vehicles, presenting good opportunities for buyers interested in used Escapes. 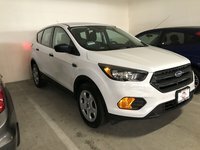 Add in the imminent arrival of a completely redesigned Escape, and savvy buyers should be able to find plenty of good deals for a used Escape. Although the Escape's platform and exterior design have not changed significantly during its 10-year run, there have been other important changes through the years, which prospective buyers should keep in mind when choosing a year and trim. 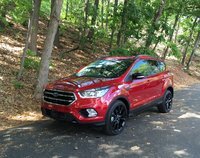 Buyers who seek plenty of power under the pedal, for instance, should probably look for a late-model Escape, preferably one built after 2009, when Ford boosted horsepower for the Escape's base four-cylinder engine to 171 hp. Prior to 2009, the four-cylinder put out 153 hp, and prior to 2005 the engine developed just 130 hp. Not surprisingly, some reviewers at the time called the earlier versions of the base-engine Escape underpowered. V6-powered used Escapes also provide good options for buyers, although fuel economy numbers suffer somewhat. Similarly, the Escape's six-speed automatic transmission, which also debuted with the 2009 model year, received good marks from reviewers for its smooth shifting, as well as its ability to improve fuel efficiency. In earlier years, Escapes powered with the base four-cylinder engine came equipped only with a four-speed manual shifter, which may affect the buying decision for these trims. Early-model Escapes were plagued by build-quality issues and recalls, so all but budget-minded buyers should avoid those model years if possible. The quality of interior materials in early-model Escapes were also not up to standard, according to some reviewers. However, for the second-generation Escape, which debuted in 2008, the quality of interior materials improved notably. Pricing for the Escape Hybrid has historically been at a premium, with the Hybrid often priced as much as $10,000 above the entry-level XLS trim. Buyers must carefully weigh the value of improved fuel economy vs. the premium cost of the vehicle, considering such factors as miles driven annually and the length of time the buyer plans to hold on to the vehicle. Buyers who place fuel economy at a premium may also want to look at Escapes powered by the base powerplant, which delivers relatively good fuel economy numbers. The 2020 Ford Escape has been announced, but it is not yet available for purchase. 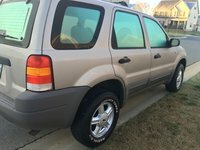 Where is the AC Condenser coil on a 2010 Ford Escape?